The Fund for Cultural Participation had an interesting question: could they create a more open proces for the smaller funding requests (5000 euro) that come their way? I brought together a group of experts, and together with a small group of their employees we developed a plan for a new online platform that merged a number of current developments:it combined the rise of crowdfunding platforms such as Kickstarter, the succes of idea generating platforms such as OpenIdeo, and the Organize-it-Yourself platforms such as ThePublicSchool. 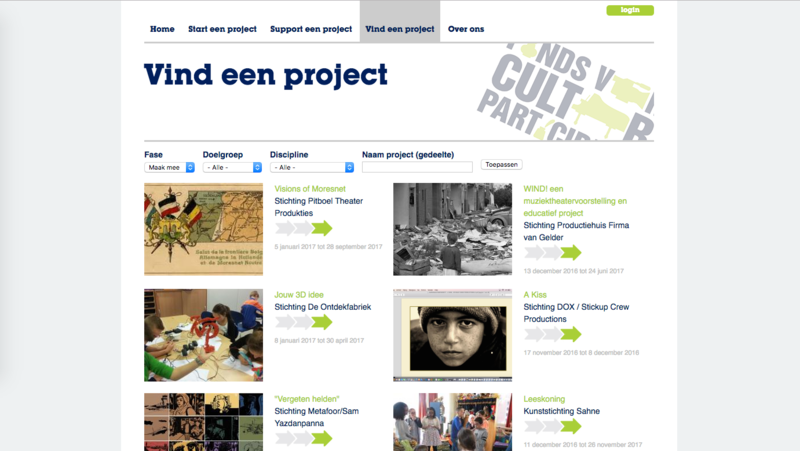 The result was jijmaakthetmee.nl (“You co-create”), a website where small proposals go through a 3-step proces to get funded. First theplans are shared in the open, then they are reflected upon by coaches and the community, and finally they may be given funding through a combination of a public vote and expert opinion. This video (Dutch language) explains the proces. After many years the project is still going strong. The maximum funding amount has been raised to 15.000 euros. Thanks to the expert participation of Michiel van Iersel, Jelte Timmer and Klaas Kuitenbrouwer.